Lattice Boltzmann Method Implementation on Multiple Devices using OpenCL, TEKIC, J. B., TEKIC, P. M., RACKOVIC, M.
A Novel Robust Interacting Multiple Model Algorithm for Maneuvering Target Tracking, GHAZAL, M., DOUSTMOHAMMADI, A.
Optimization of Charge/Discharge Coordination to Satisfy Network Requirements Using Heuristic Algorithms in Vehicle-to-Grid Concept, DOGAN, A., BAHCECI, S., DALDABAN, F., ALCI, M.
PAELib: A VHDL Library for Area and Power Dissipation Estimation of CMOS Logic Circuits, KIREI, B. S., CHEREJA, V.-I.-M., HINTEA, S., TOPA, M. D.
FPA Tuned Fuzzy Logic Controlled Synchronous Buck Converter for a Wave/SC Energy System, SAHIN, E., ALTAS, I. H.
BARKALOV, A. , TITARENKO, L. , ANDRZEJEWSKI, G. , KRZYWICKI, K. , KOLOPIENCZYK, M.
Distributed embedded systems have become larger, more complex and complicated. More often, such systems operate accordingly to the IoT or Industry 4.0 concept. However, large number of end modules operating in the system leads to a significant load and consequently, to an overload of the communication interfaces. The CloudBus protocol is one of the methods which is used for data exchange and concurrent process synchronization in the distributed systems. It allows the significant savings in the amount of transmitted data between end modules, especially when compared with the other protocols used in the industry. Nevertheless, basic version of the protocol does not protect against the system failure in the event of failure of one of the nodes. This paper proposes four novel variants of the CloudBus protocol, which allow the fault detection. The comparison and performance analysis was executed for all proposed CloudBus variants. The verification and behavior analysis of the distributed systems were performed on SoC hardware research platform. Furthermore, a simple test application was proposed. J. Lee, B. Bagheri, H. A. Kao, "A cyber-physical systems architecture for industry 4.0-based manufacturing systems", Manufacturing Letters, pp. 18-23, 2015. E. A. Lee, "Cyber physical systems: Design challenges", Object Oriented Real-Time Distributed Computing (ISORC), 11th IEEE International Symposium on, pp. 363-369, 2008. T. A. Henzinger, J. Sifakis, "The embedded systems design challenge", International Symposium on Formal Methods, Springer Berlin Heidelberg, pp. 1-15, 2006. L. Atzori, A. Iera, G. Morabito, "The internet of things: A survey. ", Computer networks, Vol. 54, no. 15, pp. 2787-2805, 2010. J. Gubbi, R. Buyya, S. Marusic, M. Palaniswami, "Internet of Things (IoT): A vision, architectural elements, and future directions. ", Future Generation Computer Systems, Vol. 29, no. 7, pp. 1645-1660, 2013. I. Ungurean, N. C. Gaitan, V. G. Gaitan, "An IoT architecture for things from industrial environment", Communications (COMM), 2014 10th International Conference on, IEEE, pp. 1-4, 2014. L. Zhou, H. C. Chao, "Multimedia traffic security architecture for the internet of things. ", IEEE Network, Vol. 25, no. 3, pp. 35-40, 2011. 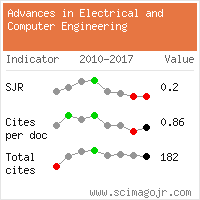 J. Milos, S. Hanus, "Analysis of LTE Physical Hybrid ARQ Control Channel", Advances in Electrical and Computer Engineering, Vol. 14, no. 2, pp. 97-100, 2014. H. Kopetz, "The complexity challenge in embedded system design", Object Oriented Real-Time Distributed Computing (ISORC), 2008 11th IEEE International Symposium on. IEEE, pp. 3-12, 2008. K. Gomadam, V. R. Cadambe, S.A. Jafar, "A distributed numerical approach to interference alignment and applications to wireless interference networks". IEEE Transactions on Information Theory, Vol. 57, no. 6, pp. 3309-3322, 2011. T. M. Chiwewe, C. F. Mbuya, G. P.Hancke, "Using cognitive radio for interference-resistant industrial wireless sensor networks: An overview", IEEE Transactions on Industrial Informatics, Vol. 11, no. 6, pp. 1466-1481, 2015. S. Hong, J. 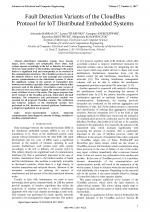 Brand, J. Choi, M. Jain, J. Mehlman, S. Katti, P. Levis, "Applications of self-interference cancellation in 5G and beyond", IEEE Communications Magazine, Vol. 52, no. 2, pp. 114-121, 2014. E. Hossain, M. Rasti, H. Tabassum, A. Abdelnasser, "Evolution toward 5G multi-tier cellular wireless networks: An interference management perspective", IEEE Wireless Communications, Vol. 21, no. 3, pp. 118-127, 2014. L. He, J. Pan, J. Xu, "Reducing data collection latency in wireless sensor networks with mobile elements", Computer communications workshops (INFOCOM WKSHPS), 2011 IEEE Conference, pp. 572-577, 2011. M. Bagaa, Y. Challal, A. Ksentini, A. Derhab, N. Badache, "Data aggregation scheduling algorithms in wireless sensor networks: Solutions and challenges", IEEE Communications Surveys & Tutorials, Vol. 16, no. 3, pp. 1339-1368, 2014. M. Adamski, K. Krzywicki, G. Andrzejewski, "EmbedCloudDesign and implementation method of Distributed Embedded Systems", Technological Innovation for Cloud-Based Engineering Systems, Springer International Publishing, pp. 157-164, 2015. A. Barkalov, L. Titarenko, G. Andrzejewski, K. Krzywicki, M. Kolopienczyk, "SoC Research and Development Platform for Distributed Embedded Systems", Przeglad Elektrotechniczny, Vol. 2016, no. R. 92 10, pp. 262-265, 2016. E. Tovar, F. Vasques, "Real-time fieldbus communications using Profibus networks", IEEE Transactions on Industrial Electronics, Vol. 46, no. 6, pp. 1241-1251, 1999. S. Biegacki, D. VanGompel, "The application of DeviceNet in process control", ISA transactions, Vol. 35, no. 2, pp. 169-176, 1996. Citations for references updated on 2019-04-22 08:47 in 136 seconds. Website conception, design and maintenance by Eugen COCA. Content updated on 28 Feb 2019. Site engine updated on 28 Feb 2019. This page was generated on the server in 0.064 seconds and loaded in your browser in > seconds.